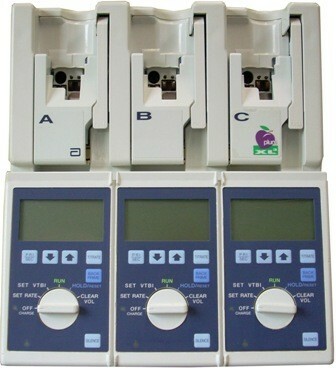 Buy or rent pre-owned, recertified Plum XLD Micro/Macro Single & Triple Channel Infusion Pumps you need today. All pre-owned medical equipment is patient ready equipment and is covered by an OEM matched warranty. The Plum XL3 Micro/Macro with DataPort is battery powered for emergency backup and temporary portable operation. It should be operated on battery power until full discharge at least once every six months for optimum battery performance and life. While DataPort is disabled during battery operation, a fully charged new battery will provide operating time of approximately 4 hours when all pumping units operate simultaneously at a rate of 125 mL/hr or a cumulative delivery of 1,000 mL at any combination of rates and pumping units. While DataPort is enabled, under the same conditions, operating time will be approximately 2½ hours.